Test manually only those more interesting scenarios. 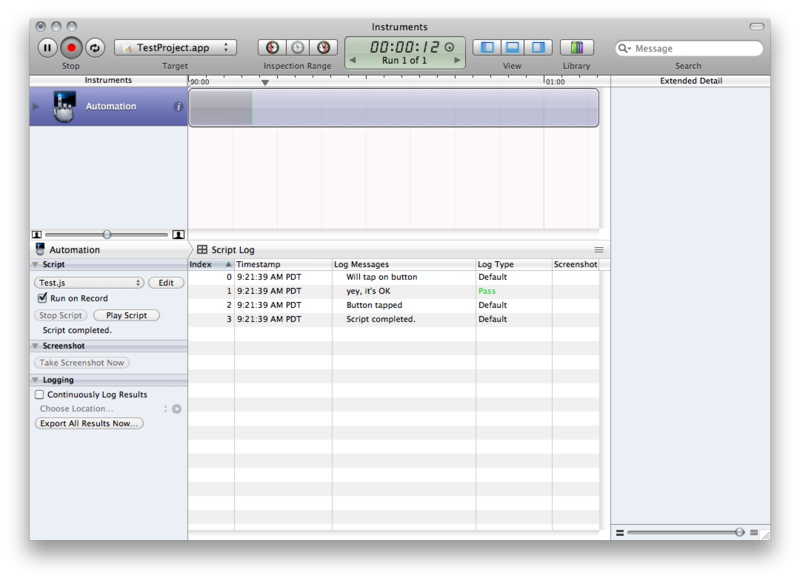 UI Automation is integrated with Instruments. What does it means? It means that you can use alongside other instruments and see exactly what’s happening with your app. It’s only supported on iOS 4.x and the device must support multitasking. The simulator or the device can be used to run the tests. If you are using 4.0.2 just substitute it in the second command. Value : Value of a control, text from a textfield, and so on. It’s very important to log everything that you are doing during the test, the more you log, the better. Every time that you interact with a control, it’s good to log what it’s being done, so when you go back to the results, it’s easier to find the problem. Let’s say that you want to know how your app looks like after some interactions, well, it’s pretty easy, just take a screenshot with. EDIT: This only works on the actual device. Ok, enough talking, let’s write a very simple test case (maybe, some other time I’ll create a more complex example for UI Automation) that will press a button and check the result in the textfield. When you click the button, the text “MyTextApp” should appear on the textfield. Go ahead, build and run your app and see if everything is ok.
What this script is doing is, getting the mainWindow, tapping on the button, and checking the textfield value. There’s a lot of information on the Reference Collection , you probably should take a look. This was a very simple example, just to give you a hint how the UI Testing works. Sometimes it’s way better to just use a simple log then debugging your app step by step. That’s when NSLog comes in handy. There’s a lot of ways to use NSLog in your code, I’ll show some of my favorites. __FILE__ : file path and name. __PRETTY_FUNCTION__ : name of the method. That’s some simple tips that I have to share about the NSLog, if anyone has anything else to add, please share it in the comments. Horray, you’ve got your mac and your iPhone, and you want to write some code and see how it goes. You can find a lot of Hello World tutorials around the web, but I believe that 95% or those tutorials use Interface Builder, and I’m not a big fan of IB, because it does some “magic” behind the scenes, and IMO it’s really nice to know everything that’s happening within your app. IB is not useless, but let’s not enter on this topic (yet). I think that’s better to write your first app without IB so you can see what’s really going on. 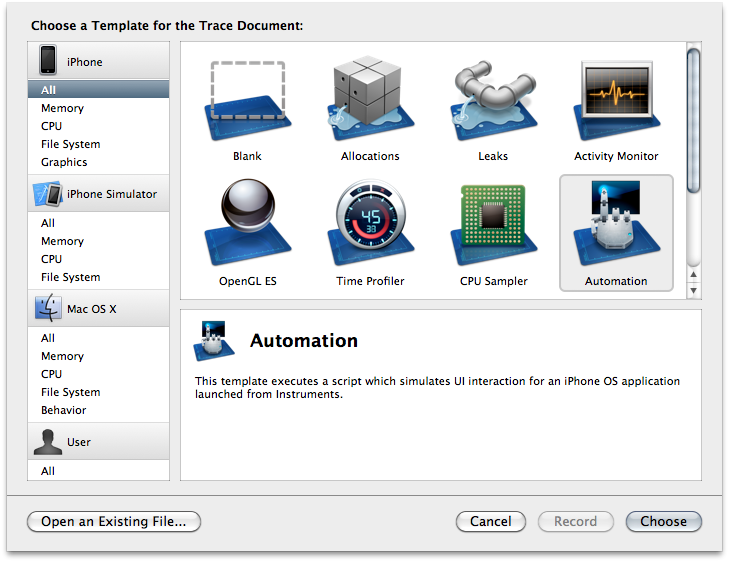 If you haven’t installed Xcode yet, go to http://developer.apple.com/iphone/index.action and get it. This dmg will install everything that you need, iPhone SDK, iPhone Simulator, XCode, and a bunch of useful apps, like Instruments and so on. By default, Xcode will be installed on /Developer/Applications/Xcode.app, go there and open it (or just hit command + space and type Xcode on your spotlight). 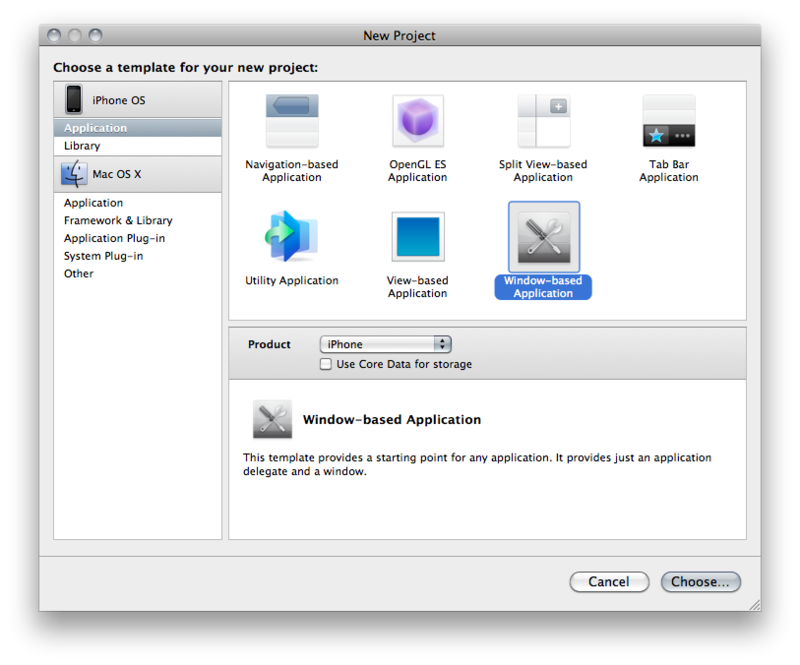 Go ahead and create a new Xcode project. You’ll be prompt to choose some project templates, we can select View-Based Application, it has a ViewController already configured, but let’s choose the Window-Based Application. The Window-Based application is the simplest template that you can think of, it will give you a Windows and an UIApplicationDelegate that responds to UIApplication. 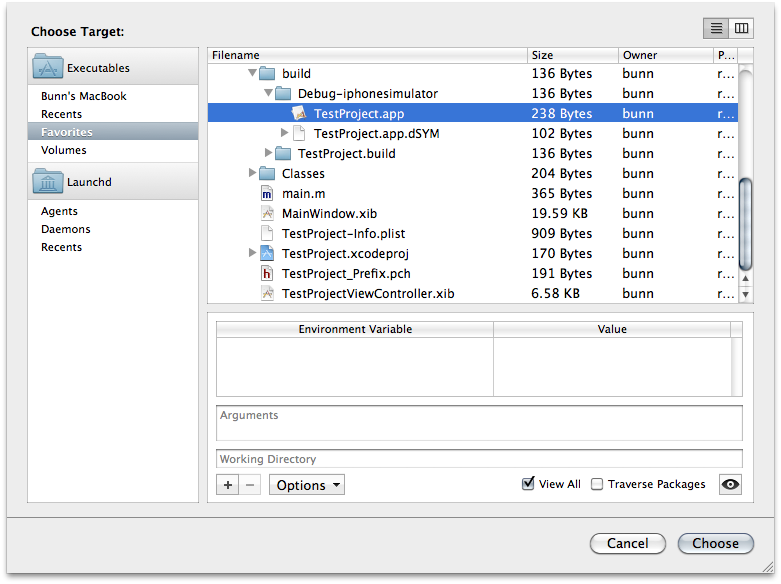 These files are required in any iOS application, so, that’s why the Window-Based application is as simple as it gets. 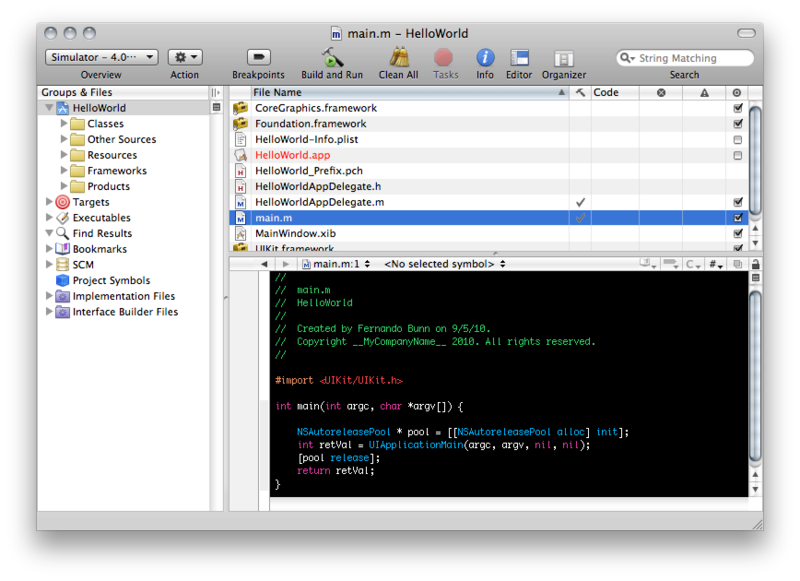 The template creates a lot of required files for you, but let’s focus on the HelloWorldAppDelegate.h and HelloWorldAppDelegate.m, but take a look in the main.m file, you can see that the UIApplication is being created there. This method gets called when the initial configuration of the app is done, and your app is ready to launch, so it’s there that you have to call your initials methods, like in this example, our UIViewController. You have to be careful in what kind of method you call in there, because if your app takes a while to respond it will be watchdogged. For example, if you call some method that requires a server response and the server does not responds back for a while, the iOS will kill your app, but let’s forget about this for now. Let’s do it right, forget about the last piece of code, and let’s start again. Let’s create an UIViewController subclass, and add it to the window. It’s on the view controller that you will add your label, and whatever you need. 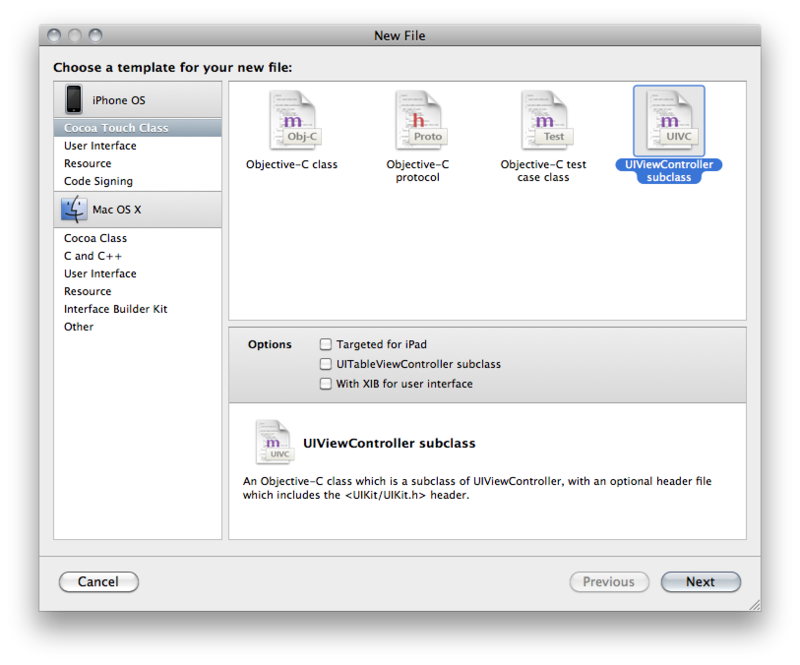 Go to File -> New File (or command + N) and create an UIViewController subclass. Open the HelloWorldViewController.m, as you can see, you have the basic file structure all ready for your use (Hey, thank you, Apple guys). Search for the method named – (void)loadView, which is used to manually populate a view controller. UIView *mainView = [[UIView alloc] initWithFrame:[UIScreen mainScreen].bounds; Creating our UIView with the same size of the main screen. CGRect labelFrame = CGRectMake(50, 50, 200, 30); The CGRect will be the bounds for your view. UILabel *helloLabel = [[UILabel alloc] initWithFrame: labelFrame]; This will create the UILabel class with the CGRect that we have created. 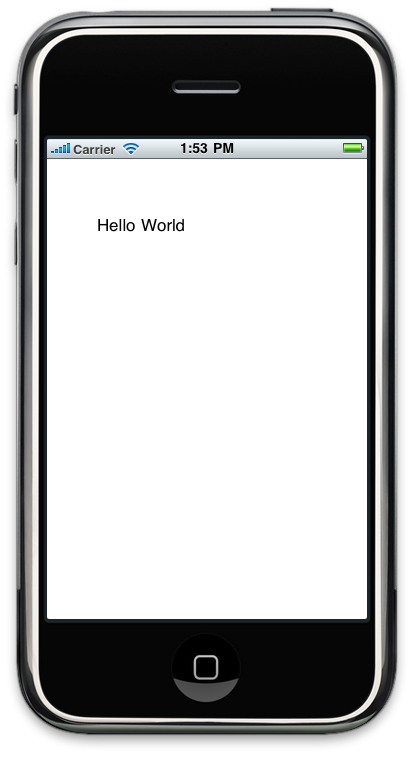 helloLabel.text = @”Hello World”; Just set the string on the label text. Why add an @ at the beginning of the string? That’s to differentiate the NSString from the C String. self.view = mainView; Adding out custom UIView to the UIViewController’s UIView. [mainView release]; The UIViewController now retains the reference to it’s UIView, so, we can release it. We are almost done, just one more thing: we need to hook up our brand new UIViewController to the HelloWorldAppDelegate and add it to our window.